We rebuilt our chicken tractor (portable chicken coop). The tractor measures 3 metres long x 1.5 metres wide x 1 metre high. 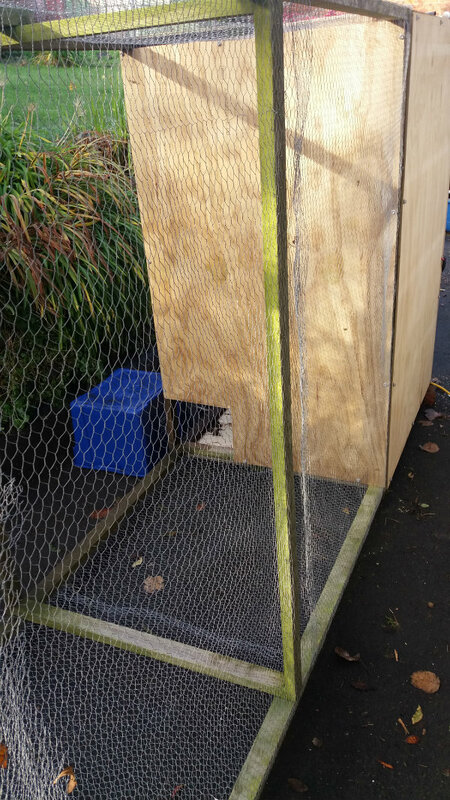 The run end opens completely for full access, and the shelter end has a half-height hatch for access to eggs, bedding and food. The hatches have two hinges each, and are secured with fencing nails (these form loops) through which we ran light chain and attached padlocks. The shelter end was painted with leftover paint we had in the shed. 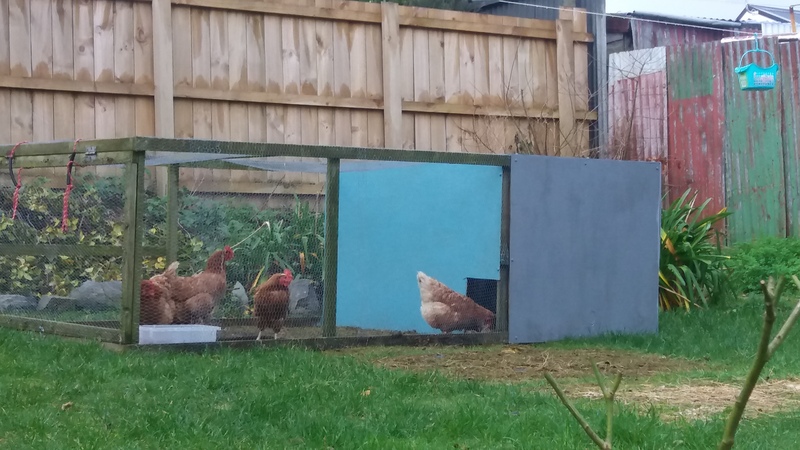 The chooks really seem happy in their new home! We also attached handles made from a small length of rope and some old hose we had lying around. The handles make it much easier to move the tractor around the garden to fresh grass every two weeks. The nesting box inside the shelter end is an A4 plastic box we bolted to the side of the shelter end frame with more wood screws. It has drainage holes we drilled to help keep it clean. The tools we required for this project were just a power drill, a hammer, a special drill bit for the wood screws, a hand screwdriver, a staple gun (for attaching the chicken wire, bolt cutters (for cutting the chain), and heavy duty scissors (for the chicken wire). 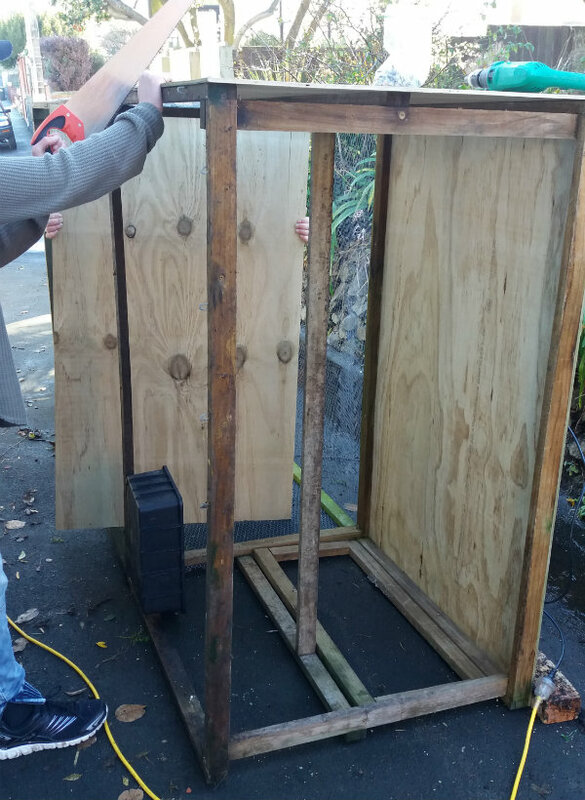 The wood was all cut to the right sizes at the hardware shop (Bunnings NZ) for us for free, although we did find we needed a small saw for cutting the access hole between the shelter end and the run part of the tractor. I designed this tractor, after looking around online and finding nothing that suited my needs (i.e. a cheap, easy to build, functional chicken tractor!). It’s into it’s sixth year (I think) and is looking great, especially with the new cladding on the shelter end. What is a chicken tractor and how does it work? We recently renovated our chicken tractor for our new chickens. In case you were wondering what a “chicken tractor” is, it’s a portable chicken coop. They’re cheaper to build and they have no flooring. 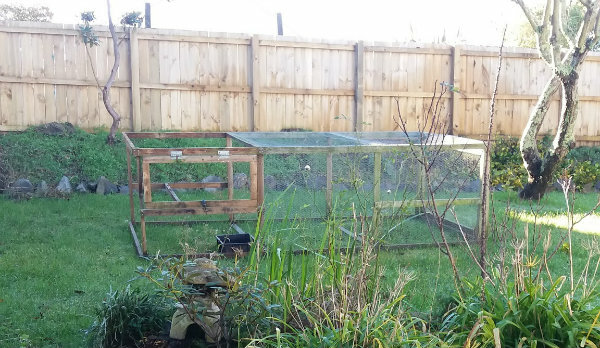 A chicken tractor stays in place in the garden for anywhere between 2-4 weeks, depending on how long it takes the chickens to turn over the ground and make it muddy and remove most of the grass. Then you pick up the tractor and move it along (the chickens stay inside while you move it!) to the next plot of fresh grass. 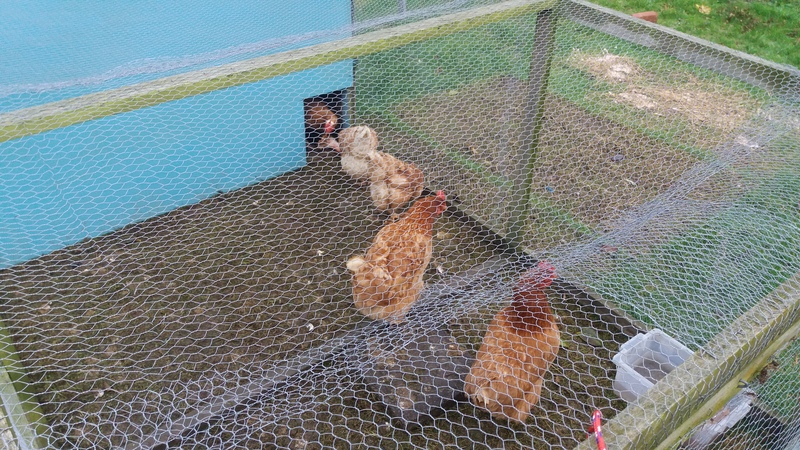 The benefit of this is you never have to clean a coop out, you don’t attract rats or mice, the chickens get fresh grass, and the chooks are always adding fresh manure to the ground, which the worms and grass love. Once the ground has been turned over, you can choose to throw some grass seed on if you want, but in New Zealand everything grows like crazy so I’ve never bothered. For the system to work well, you need to have about 6 x the amount of floor space that the tractor takes up, so that by the time it returns to its original position on the grass, it’s been a minimum of 12 weeks gap for the fresh grass to grow. This is usually enough for everything to re-seed properly, even over winter, but if you need more space adjust accordingly. In summer, move the tractor under trees for shade, and in winter move it out into full sun to keep your chickens happy and warm. I built our chicken tractor with a friend about six years ago. Originally we clad the sleeping quarters end of the chicken tractor in some old swimming pool “blanket”, which looks like very thick oversized bubble wrap. 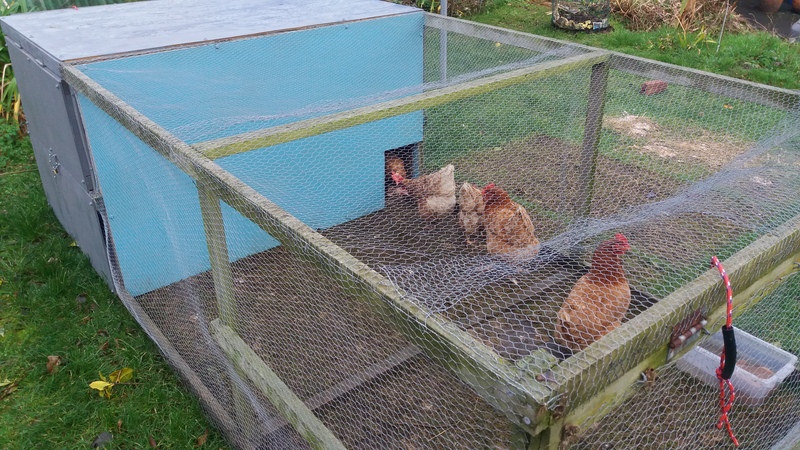 It worked well, was cost-free as it was second-hand, and it kept the chickens warm in their sleeping area. You can see a picture of how the tractor looked below. 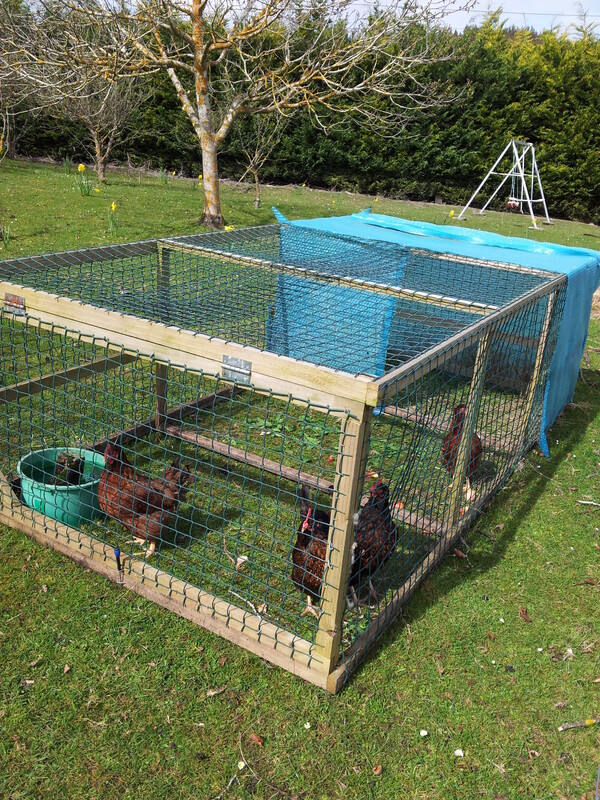 What the chicken tractor used to look like, with blue plastic on the sleeping end. Note: The sleeping end has a perch that runs at half height the full width of the sleeping quarters. Chickens like to perch at night, off the ground. It helps them feel safe and happy. Over time, we found the blue plastic “pool blanket” perished and ripped, and a complete re-cladding of the coop was necessary. We re-lined the run end with chicken wire (the original version used green plastic mesh) a couple of years ago, but the sleeping end needed a re-clad too now. The tractor with its blue plastic removed. You can see how the frame is put together, if you want to build one. A quick measure up, and we were down to our local Bunnings warehouse. We bought 7 mm thickness second quality treated structural plywood, so it won’t rot when it gets wet. Note that if you do build a chicken tractor, you’ll need to use treated wood to avoid wood rot. Most treated pine is very affordable and designed to last 20+ years in all weather. Adding the new cladding to the chicken tractor. This was attached with self-tapping wood screws and a drill. We cut out a small opening between the housing end and the run. The tractor is on its side in this picture, while we worked on it. We attached the new plywood to the old frame using the original wood screws that had been used to attach the blue plastic – I’d unscrewed and cleaned them up with a scrubbing brush and hot water when we removed the remnants of the plastic. Re-using hardware saved a lot of money in projects like this! Then we painted the coop up using some leftover exterior house paint that had been left in our garage when we moved in. It wasn’t a great colour (grey) but it was free, being leftovers, and suited to purpose. The paint will also help further protect the wood and weatherproof the coop. The tractor painted, and rope handles attached. We may have to do more decoration as the grey is pretty grim! The final step was using gap sealer to seal gaps in the corners of the sleeping quarters. We don’t want the cold winter wind getting in and ruffling any feathers! We hope the newly-clad tractor will last for many years, and keep our new chickens very warm, dry and happy! A chicken tractor this size can comfortably house six chickens (or five hens and one rooster), but 3-4 birds is a more comfortable fit. We have six chickens in our tractor at the moment, but two are destined for the pot in a couple of weeks. Four chickens is a much better fit for this size of tractor. We found that 3-4 birds is ideal, because our household provides an almost perfect amount of leftovers to feed the birds, so we have virtually no costs in chicken food. This is a win-win – our food waste becomes a usable product, and we get free eggs. Plus, chickens fed on household scraps are happier and healthier than chooks fed nothing but pellets! Chickens are really easy to look after. Our chickens are hylines – they’re great little layers, and easy to handle. Like all animals, they need fresh water, plenty of good food, and appropriate shelter. Chickens also need oyster grit to create good strong eggshells. You may have heard that they can use ground up eggshells instead of grit – this is true but it can encourage them to eat their own eggs which you don’t want! Instead, use the crushed eggshells on the garden, and buy a bag of grit. It’ll last forever and is very cheap. Put a small amount in a heavy bowl – they won’t take much but they will use it. We replace their water every 2-3 days, or if it gets mucky before then. You don’t need a fancy water container – we’ve always just used a bucket or plastic container. Just make sure the water level is accessible, and there is a brick or similar in the bucket so it doesn’t get knocked over – chickens like to perch on the edge of their water container to drink! Chickens eat practically anything from the table – including chicken! Ours eat everything except avocado pits and peels, carrot tops, lollies (hard sweets), and actual bones. 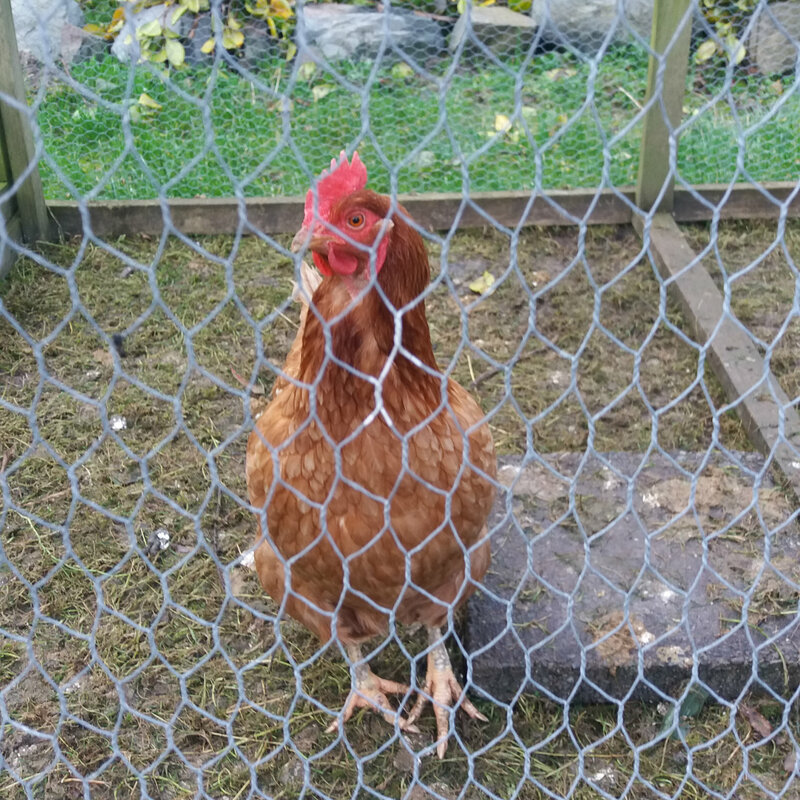 We feed our chickens every leftover from the table, including: bread crusts, stale bread, apple cores, leftover veggies, leftover meat, leftover burgers and pizza, dripping and fat from roasting trays, fish fingers, tofu, curry, you name it! When we have a lamb or chicken roast we throw all the bone leftovers in the cage. The chooks love it! They peck every tiny scrap of meat away and even eat the marrow if they can get at it. Snap big bones open with a mallet – they’ll peck at everything inside. Chickens need proper shelter, especially in extreme climates. Where we live, it gets down to freezing and we have a couple of snow days each year, so the tractor we’ve built does them fine. But if you live in a really cold climate you’d want to build a tractor with two layers of plywood and insulation between. Chickens are known to overheat on hot days, so move the tractor away from direct sunlight if it’s going to be a scorcher. Finding good layers… and how to pick an old bird! I messed about with fancy birds for a few years, but these days I stick to Hylines or Brown Shavers. It’s up to you what breed you go for, but for a good layer try to find birds that are less than two years old. The older a bird gets, the bigger the eggs they will lay over time. Their comb will be pale or dull, and their legs pale and extra scaly. Most of the better layers tend to be smaller, lighter breeds. A good layer will give you at least 5 eggs a week, sometimes more. If you want to keep a rooster, be aware that many councils have restrictions, due to noise. Check first, before getting your roo in. Chickens don’t tend to get too many parasites, but they can get red mites. If they do, you can buy dusting powder from the local vet. It’s the same powder that is used for horses, so if you have a horsy friend ask if they have some first.